The main SEC group responsible for policing Wall Street has hired only five new staffers despite losing more than three dozen since the waning days of the Obama administration, according to a Bloomberg Law review of agency records. A spokeswoman for SEC Chairman Jay Clayton declined to comment. Bloomberg Law in August reviewed SEC personnel records to determine the number of people who have joined and left the agency since January 2017. The data, obtained through Freedom of Information Act requests, reflects arrivals until May 29 of this year and departures as of July 13. Arrival and departure statistics compiled on the Enforcement Division don’t include regional enforcement staff or agency employees who may have transferred into or out of it. The SEC since 2017 has lost about 330 employees, 37 of whom worked in the Enforcement Division. The agency in that time only has brought in about 100 staffers, with the five new Enforcement employees coming in 2017 and none arriving this year. The division is the commission’s largest group. It has about 530 employees, roughly 12 percent of the approximately 4,500 workers at the agency. Jackson isn’t alone in his assessment that the drop in staff has contributed to a drop in enforcement. 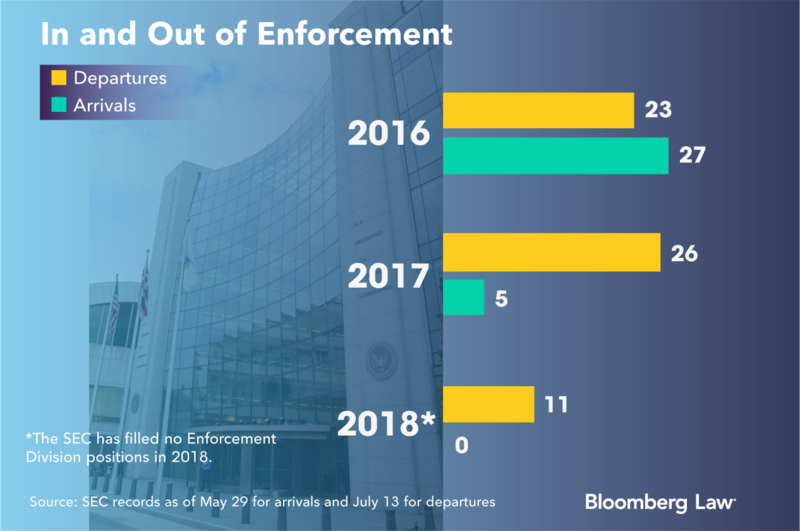 Former SEC attorneys told Bloomberg Law the decrease in staff is at least partially contributing to a decline in enforcement activity. “When I was down staff, I’d be looking harder at whether to open investigations,” Stephen Cohen, a former Enforcement Division associate director and chairman of its hiring committee, told Bloomberg Law. Having limited resources doesn’t mean the division will avoid bringing big, complex cases, according to Cohen, who left the SEC in 2016 and is now a partner at Sidley Austin LLP in Washington. “The division is never going to leave behind a situation where they think there is real investor harm, even if it’s complicated,” Cohen said. The types of securities law violations the division prioritizes in its investigations also can change between SEC chairmen, however. Clayton, a Republican-leaning independent, has put retail fraud, including scams involving cryptocurrency, at the top of his enforcement agenda. Mary Jo White, Obama’s last SEC chairman, embraced a “broken windows” approach intended to promote compliance at firms by aggressively pursuing smaller violations. The staff decline has forced the SEC to “become a little more strategic about how they go about bringing enforcement actions and addressing potential violations,” Matt Rossi, formerly assistant chief litigation counsel at the agency, told Bloomberg Law. After leaving the agency in 2014, Rossi joined Mayer Brown LLP as a Washington-based partner who co-leads the firm’s securities litigation and enforcement practice. Enforcement under Clayton also has drawn worries from Democrats in Congress. Former Chairman White first put in place a hiring freeze in the fall of 2016, shortly before the presidential election. President Donald Trump implemented a governmentwide hiring freeze in January 2017, just three days after his inauguration. The Trump administration lifted the freeze three months later but urged agencies to keep tightening budgets. The commission in May 2017 decided to voluntarily continue the freeze, which remains in place more than a year later. The agency can make a few exceptions to the freeze, according to a budget justification report. The Enforcement Division is still “adequately resourced to do our jobs,” but is seeking “an additional 17 slots for enforcement” in its fiscal 2019 budget request, Steven Peikin, SEC co-director of Enforcement, said at a May 16 House Financial Services subcommittee hearing. The agency has asked Congress for $1.658 billion in funding for fiscal 2019, which will begin Oct. 1. The sum is $6 million more than the $1.652 billion the SEC has this year. “To the division’s credit, they have a pretty well-earned reputation for doing more with less in cycles of tight fiscal limitations,” Cohen said. Many Enforcement Division employees still seem to “really love working there,” despite the resource constraints, he added. “If morale were really low and people hated their lives at the SEC, one would expect a greater reduction in the workforce,” Velikonja said. Outside factors have also had a negative impact on enforcement activity. A legal battle over the constitutional status of the agency’s in-house judges has caused delays in administrative cases. Investment adviser Raymond J. Lucia said the commission’s administrative law judge who barred him from the industry had been unconstitutionally appointed, and the Supreme Court in June agreed. The SEC stayed all ALJ proceedings after the court handed down its decision and only lifted the stay Aug. 22. About 100 pending administrative proceedings must be reheard by a new ALJ. The commission “is making the best of a tough hand dealt it by the Supreme Court in Lucia,” Matthew Solomon, formerly chief litigation counsel at the agency, told Bloomberg Law. Further delays are likely as litigants before the SEC’s in-house judges “are certain to mount additional challenges,” Solomon said. He joined the agency in 2012 and has been a partner in Cleary Gottlieb Steen & Hamilton LLP’s Washington office since leaving the SEC in December 2016. The SEC sent its more contentious cases to federal court rather than its in-house forum during the legal battle, which also slows the pace of enforcement.